I write a weekly travel column for the Columbia Daily Tribune. This blog had focused on stories about American Indian Sites and includes more pictures than my column allows for. I added some stories about native people in other places and will now be putting in stories about American Presidents homes and museums and stories I have written about historical places and museums in the United States. I recently gave a talk based on the book, Beyond the Beach: The Allied War Against France, written by my son-in-law Stephen Bourque. The war with Germany was a disaster for France. They surrendered in seven weeks to Germany's blitzkrieg techniques. Britain lost much of its armaments but rescued most of its troops from Dunkerque. France became a base of operations for the Germans, and 40% of French manufacturing turned to producing war materials and weapons for Germany. Something that is seldom talked about was the rain of bombs this brought upon the French population. Because the Germans were making so much use of French facilities, the Allies attacks on them caused must damage to non-military structures and civilian populations. Day light bombing turned out to be inaccurate and the Germans could shoot down more planes, so Britain took to bombing at night doing carpet bombing in hopes it would destroy valuable factories making military equipment. That insured even more collateral death and damage. The allies bombed 1,570 French cities and towns killing 68,778 men, women and children over the course of World War II. This was greater than the damage done to Britain by the German bombings and attacks with rockets. More than 100,000 French were injured, and 432,000 houses were completely destroyed. During Allied attacks on Normandy during landings we bombed railroads, bridges and armored sites killing more French citizens, 10,000, than German soldiers, 7000. Many of the bombing raids were against the V1 flying bomb an early cruise missile that Hitler intended as a "Vengeance weapon" against the British. He hoped to create terror in London as revenge for the bombing they were doing in Germany. From French bases 9,521 were launched, but with the use of antiaircraft, balloons on cables and fighter planes the Allies learned to shoot many of them down. Debra and Steve were able to visit a V1 missile site at Val Ygot near Ardouval. 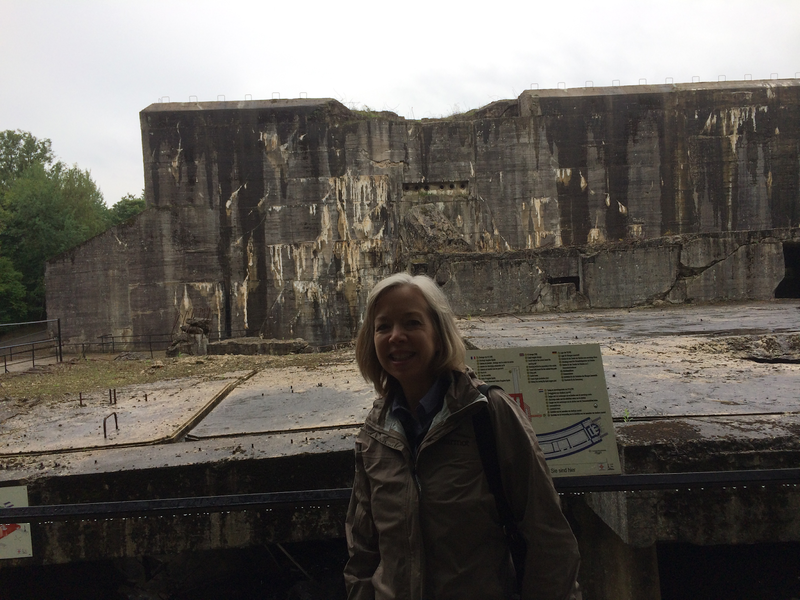 For my talk Steve had sent me pictures of areas bombed and one large cement structure seemed especially important, "the blockhaus at Eperlecques." 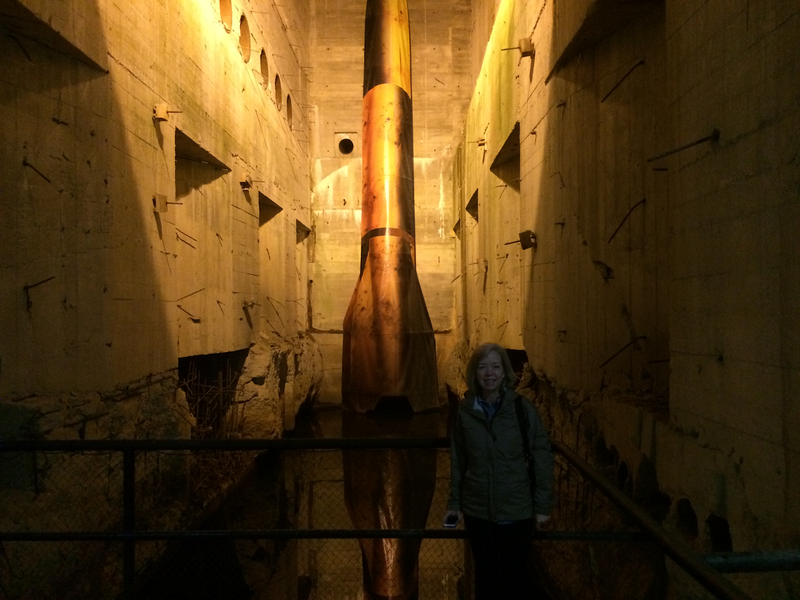 This is a massive cement structure built by the Germans with slave labor to house rockets V1 and V2. The blockhaus was practically imperious to bombs, even bombs developed specifically to destroy it. They did take a heavy toll on slave labor that was being used to construct it. To avoid detection the V2 was shot off mobile launchers that could be moved around the northern part of France. The Allies spent much time and energy trying to find these sites and destroy them, but they could be set up so quickly that it was almost impossible to stop them. The V2 rocket sites hurled bombs carrying a warhead of 2,200 pounds at 3,500 miles an hour at London. The V2 were so fast victims heard them incoming only after they had hit since they were faster than the speed of sound. When it exploded it could create a crater 30-40 yards wide and 15 yards deep. The consequences of the V2 becoming successful had implications for its danger to targets as far away as the United States. 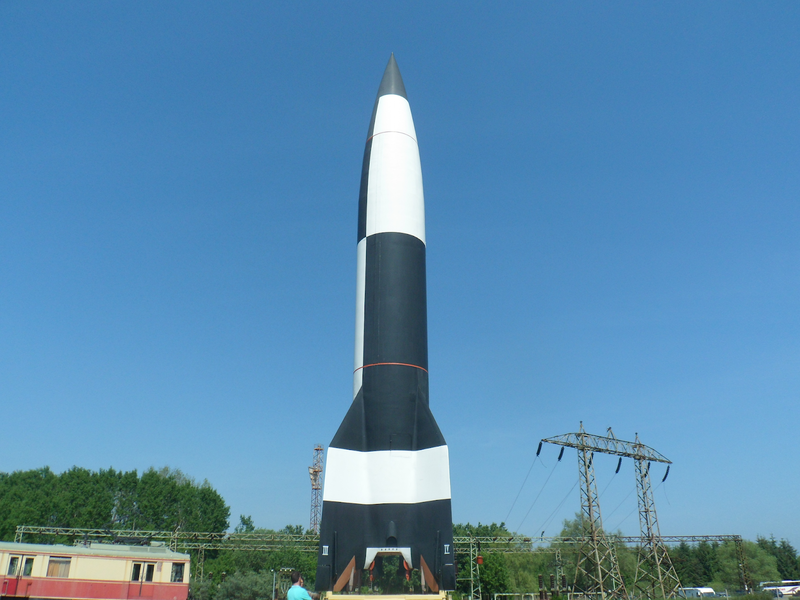 Wernher von Braun was the German aerospace engineer developing this rocket technology. The German hope was that with a little more time they could develop rockets that would reach the United States. At the end of the war von Braun and his team escaped from Russia territory to surrender to the U.S. Army. Braun and his team went on to advance space science in America and help us reach the moon. My daughter Debra Anderson made a number of these research trips to France with Steve. They spent a lot of time in Northern France where many of these sites are located. She recommends visiting the blockhaus at Eperlecques, which has been converted into a museum. It's an impressive structure with descriptions written in English and French. On their trip, they flew into Charles de Gaulle Airport outside of Paris and drove two and a half hours north. You could also drive south 30 minutes from Calais on the English Channel. The museum has a website and you should find the location on the map before venturing out. 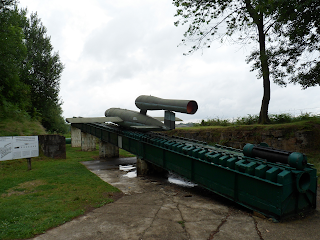 There are also missile sites at Siracourt, which is an hour south of Eperlecques and Val Ygot at Ardouval, another hour and a half west. The coastal towns in the area include Calais, Bologne-Rouen, and Dieppe, all of which are pleasant. Debra and Steve particularly enjoy visiting Rouen, which is rich in history. Claude Monet made numerous paintings of the cathedral there, and it has a plaza commemorating Joan of Arc. Getting off the beaten path can make for an enjoyable, and often surprising, adventure.